Sometimes writing is easy; other times not so easy; and then there are the times it’s downright difficult. I started working on the third book in my Puzzle House series, probably more than a year ago. And it just wasn’t happening. I couldn’t “see” the story. I’d write some then get stuck, go write something else, then come back and get stuck again. This happened again and again. Since I started writing this third book, I actually finished three other books and submitted them and got contracts. Yea! I did final revisions on two other books, and started yet another book. 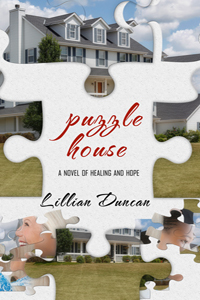 Each time I finished a project, I’d go back to the Puzzle House book–currently titled–SUFFER THE LITTLE CHILDREN. Believe me, I was suffering with this book. Anyway, I’d go back to it and start rewriting and then…I’d get stuck once again. I began to doubt that it would ever get finished, but it was more than half done so I didn’t want to just forget about it. PUZZLE HOUSE tells the story of Rachel and how Puzzle House came to be as Rachel shares about her life and struggles with a young girl named Nia. THE DAVID YEARS which will release in August of this year and continues the story of Nia. My idea for SUFFER THE LITTLE CHILDREN would bring the story full circle and back to Puzzle House. But sometimes things don’t go as planned. And then I did what I should have done long ago. I gave the whole mess to God and asked him to help me figure it out. Sometimes in life, we work so hard to figure it out–to get it right–to do it by ourselves that we forget we are never alone. God is always there waiting for us to turn to Him. And God is so faithful! So loving. So good! And the good news is that I was finally able to “see” the ending of the story. So…I’m pleased to say I finally wrote THE END on the first draft of Suffer The Little Children! Previous Love is in the Air!